As a person ages, the natural lens becomes more rigid and functions more like a monofocal lens. Traditional monofocal lenses, including lens implants, focus light to only one point in space. A multifocal lens has more than one point of focus. A bifocal, which is a type of multifocal lens, has two points of focus, one at distance and the other at near. The benefits of a multifocal lens implant focuses light from distance and near simultaneously. This feature addresses both distant and near vision and makes the recipient less dependent on eye glasses or contact lenses. It’s important to know that there are choices of lens implants to improve vision. IOLs are synthetic lenses that are implanted inside the eye during surgery to replace the natural lens. The type of IOL determines the quality of vision improvement. Following a comprehensive examination, Atlanta Eye Care optometrists counsel each patient about the best IOL option according to their lifestyle, medical and eye health history. While insurance or Medicare will pay for qualified cataract surgery using the standard monofocal lens, vision for one distance only, there may be additional cataract surgery costs if you decide a premium lens is right for you. All of this will be explained to you during your cataract evaluation and consultation. 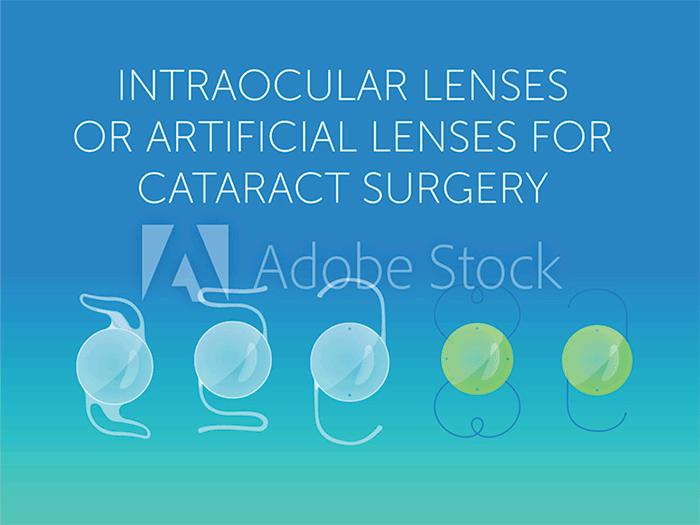 Monofocal intraocular lenses are the standard or conventional type of IOL and by definition provide good vision correction for one distance only. The power of the lens is pre-calculated for each individual, generally for far vision. Eye glasses for reading will still be needed, and patients with astigmatism may still require eyeglasses to sharpen their distance vision. Patients who have significant amounts of Astigmatism may want to consider a specialty implant called a toric intraocular lens. Astigmatism, which occurs due to a cornea that has a football rather than a basketball shape, can create blur and double images when viewing objects at any distance. standard monofocal, multifocal and Accommodating IOLs can improve nearsightedness, myopia, and farsightedness, hyperopia, but not astigmatism. Toric IOLs are uniquely designed to reduce astigmatism and may be an option for patients who are having lens exchange surgery with or without cataracts. To obtain the best vision without eyeglasses following lens surgery, the toric IOL is the best option for patients with significant astigmatism. Ask one of our Atlanta Eye Care optometrists about astigmatism and if you would benefit from the toric IOL technology. Unlike conventional single vision IOLs, accommodating IOLs are lens implants that are designed to provide functional vision at different distances using different points of focus. The goal of an accommodating IOL is to minimize the use of eyeglasses. Accommodating IOLs are premium intraocular lenses that expand the range of clear vision with both an aspheric design and flexible “haptics” — the supporting legs that hold the IOL in place inside the eye. These flexible legs allow the accommodating IOL to move forward slightly when you look at near objects, which increases the focusing power of the eye enough to provide better near vision than a conventional monofocal lens. Some patients may still prefer to wear eyeglasses for prolonged reading, but the vast majority of accommodating IOL patients experience freedom from eyeglasses for tasks such as driving, watching TV, using their cell phone and computer, looking at photos, reading magazines, price tags, product labels, receipts, and menus. Multifocal intraocular lenses are premium IOLs designed with several focusing zones precalculated on the lens which provide vision correction at all distances. Multifocal IOLs can decrease the need for reading glasses or computer glasses after cataract surgery. Like multifocal contact lenses, these premium IOLs contain added magnification in different parts of the lens to expand your range of vision so you can see objects clearly at all distances without glasses or contact lenses. Many times, patients who have worn contacts to correct near and far vision, are likely to be happy with multifocal lens implants. Atlanta Eye Care can help you decide if multifocal IOL’s are the right choice for you. Multifocal IOLs come with additional charges beyond what insurance or Medicare allows, but are frequently preferred over monofocal IOLs (standard IOL) because they can reduce or completely eliminate the need for eyeglasses. Limbal relaxing incisions are a refractive surgical procedure to correct minor Astigmatism in the eye. Incisions are made at the opposite edges of the cornea, following the curve of the iris, causing a slight flattening of the cornea. These incisions do not cause glare and other visual effects that result from other corneal surgeries like Radial Keratotomy. LRI has become the most common technique to correct Astigmatism during cataract surgery. They are a simpler and less expensive alternative to laser surgeries such as LASIK or PRK. Recovery is generally quick and painless. Choices of Lens Implants – IOLs: If you have cataracts, let the experts at Windward Eye Care or Alpharetta Eye Clinic help you through this milestone condition. They will cut through the confusion and help you make the right choice. Schedule a consultation appointment today. Your vision is important. An intraocular lens (or IOL) is a tiny, artificial lens for the eye. It replaces the eye’s natural lens that is removed during cataract surgery.